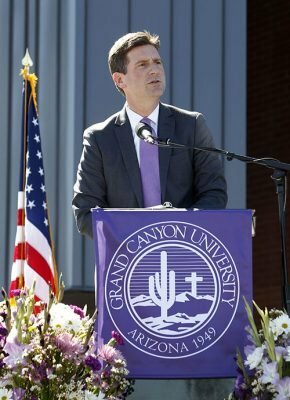 It was a gathering Wednesday afternoon to celebrate Grand Canyon University’s transformation of the previously forlorn northeast corner of 27th Avenue and Camelback Road, and a heavyweight lineup of dignitaries kept one-upping each other. 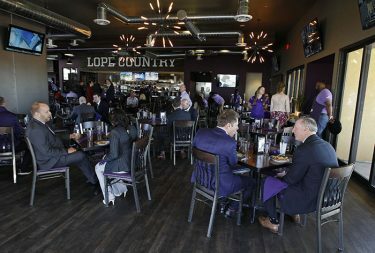 Not just about the new complex, which contains the four-story, 325,000-square-foot office building, the completely refurbished GCU Hotel, the Canyon 49 Grill, a four-story parking garage, plans for a business innovation center and possibly more retail or hotel expansion. 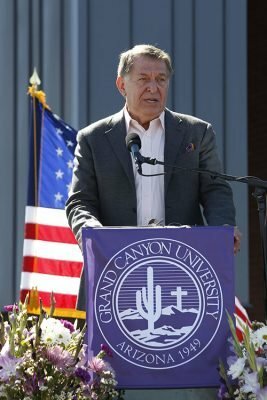 Moreover, it was about what GCU’s servant leadership has accomplished on its campus, in its neighborhood and in the Valley. 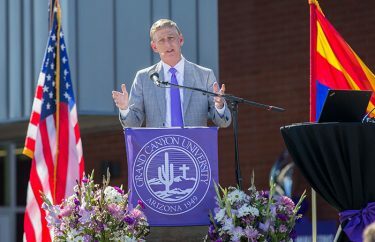 The more than 2,000 employees in attendance, a sea of purple situated in the bright sunshine next to the new office building that is now their glistening workplace, heard one sound bite after another that brought home what it all means. The figures from an economic impact study by Elliott Pollack & Company are staggering. The report found that the 27th Avenue complex will pump an estimated $660 million, including wages of more than $250 million, into the local economy each year. Tourism from the hotel and restaurant will add another $9.8 million. 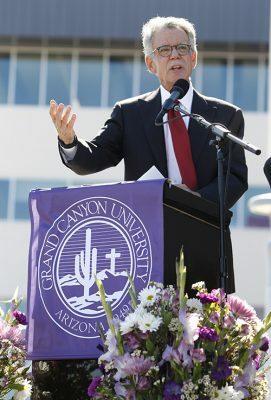 But even more incredible is GCU’s $11 billion in overall economic impact in the last 10 years, according to Pollack, resulting in tax revenues of $300 million for the state, $85 million for the county, $73 million for Phoenix and $652 million for the federal government. GCU took a parcel at 27th Avenue with nothing more than a rundown hotel, other seedy enterprises and a history of criminal activity, and it turned it into a thriving commercial hub. 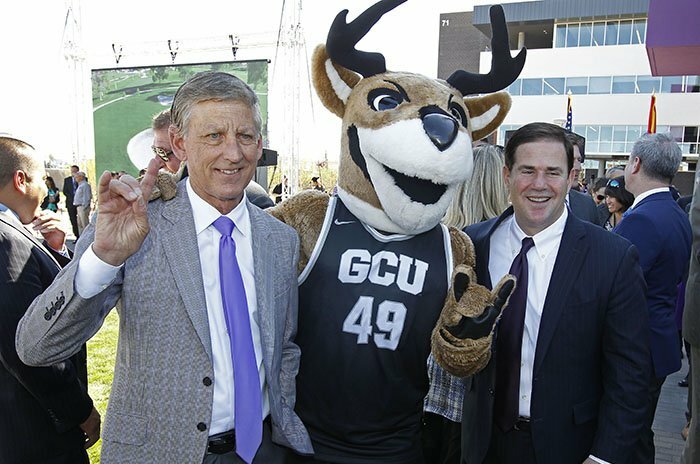 The 155-room GCU Hotel has completely renovated rooms at affordable prices ($79-89) and a pool and patio area you would find in a high-end resort. The 300-seat Canyon 49 Grill features a full breakfast/lunch/dinner menu, coffee bar, live music in the evenings and outdoor patio games. The four-story office complex will be home to student service departments that support the University’s 80,000-plus students – approximately 65,000 online and 17,500 on the ground campus. And the 131,000-square-foot building that was converted from a swap mart into an office building will now transition into a business, economic and education innovation center for new ideas and business ventures. 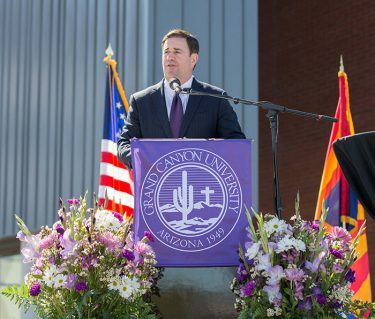 It also will be home to GCU’s New Business Development Center, which opened last summer. NBDC offers free seminars, resources and one-on-one consulting for existing business owners and aspiring entrepreneurs in the Canyon Corridor area. Besides providing a look at the new amenities at 27th Avenue, the event on Wednesday was designed to serve as a thank you to the employees who recently relocated there from their previous locations in north Phoenix and Tempe. 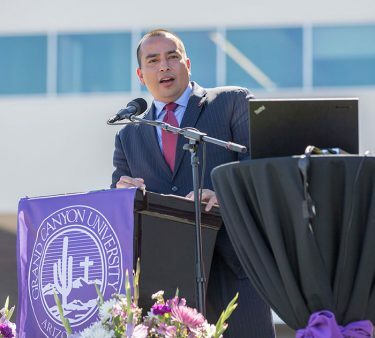 Putting all 3,600 of the University’s employees in the same zip code is an important step economically for the area, while also injecting everyone with the spirit of the main campus. But speaker after speaker also noted the importance of a student population willing to go out into the neighborhood and continue the work that has resulted in a 30 percent rise in home values and 30 percent drop in the crime rate. But Colangelo said there’s no getting around the fact that it wouldn’t have happened without Mueller’s vision. “Another thing that I think we’re really blessed with, and that’s the leadership of Brian Mueller,” Colangelo said. “When he approached me originally, I sensed someone who really had a vision, he had a plan. So to see this being executed has been a real fun experience for me. Leave it to Colangelo to have the last and best word on a day that was on the up and up. ● Here’s a story about the employees’ reaction to being on campus.